Non- compliance is another way of describing children rebelling or opposing authority. Most parents will experience non-compliance at some point during their parenting years and it’s not always a bad thing. As our children mature and develop their own personalities and standards, they may decide to stand for something they are passionate about and we as parents, need to be able to reason and compromise with them when that is the case. Just because your child has exhibited non-compliance at some point, it does not mean you need to seek child therapy for them. However, non-compliance on a daily or weekly basis from your child is unhealthy and a predictor of adult pathology if not reckoned with early and may be cause to seek some form of child therapy. Children are like sponges and they soak in everything. They are silent judges of parent behavior and will always test to see what they can get away with. This is normal behavior for a child. This is why it is important to have rules within a household. Rules set the stage for what is allowed, acceptable and what is not. When there are no rules or expectations of a child, it is then unreasonable to discipline the child for breaking rules /expectations that don’t exist. Ultimately, non-compliance is only an issue when expectations or rules exist within a household and they are broken or not met. When dealing with non-compliance there are some important factors to consider before carrying out any form of justice or discipline -similar to a court room. Has your child heard and understood the rules or expectations clearly? At the time the child is presenting non-compliance, could there be a contributing factor you may not be aware (fear, under duress from another party etc.) that is motivating the non-compliance? These two reasons need to be ruled out before addressing non-compliance issues. Stay in the ring with your child. By this I mean, don’t dismiss or walk away from conflict because you are tired or can’t be bothered to enforce discipline. If and when you fail to enforce discipline, this is a very strong message to your child and the unwanted behavior will likely repeat itself. Children may try to wear us down and for that reason, parents must be prepared to get in the ring and sustain the course of the battle. Enforce correction in both acts of commission and acts of omission. For instance, your child can say NO! I won’t do it (Act of commission), or commit the same crime and say “Yes, I’ll do it and not follow through. They are both acts of rebellion and as parents, we need to be aware of that. Look into your child’s eyes and make sure they understand what your expectations are. When you look into their eyes, it becomes difficult for them to maintain a rebellious stand. Make sure you are in close proximity to your child when requesting them to do anything. 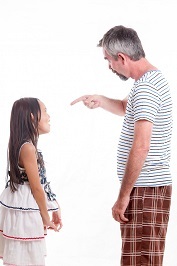 The idea of yelling at a child who is downstairs while you are upstairs sabotages the process. They need to know the issue is important enough that it requires your attention. By you coming to them, this sends that message home. Count down- from a given number (5-10 works0 giving them time to consider the consequence that will follow if they continue to be non-compliant. There must be consequences for rebelling, breaking rules or not living up to expressed expectations. If your child believes they can get away with murder, they will continue to test more and more boundaries. This ultimately becomes a problem for you. It is not my intention within this article to tell parents how to discipline their child, rather how to recognize true non-compliance and to encourage them to do something about it. If you believe your child is acting out and may benefit from child counseling and /or child therapy, anger management for kids or social and emotional learning, Positive Kids is an after school provider of skill sets that address issues like self-control, self-management, social awareness, problem-solving and decision making. Children ideal for this program include children who need ADHD help, ADD help, anger management help for kids, child therapy, confidence building for kids, self-esteem help for kids. Find and register at a Positive Kids provider near you. We operate throughout the Greater Toronto Area.